Victim reported her parked vehicle and another parked vehicle were struck by a vehicle in the parking lot of Walmart Supercenter located at 415 Conley Road. 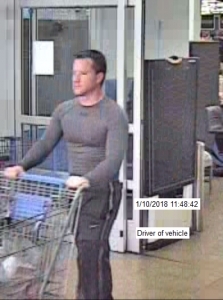 Video provided to CPD shows this man as a possible suspect who was driving this vehicle which struck the two vehicles while driving through the lot. If you have any information on the identity of this person, or any information on this vehicle, contact CrimeStoppers at (573) 875-TIPS (8477).